LO 20W x 16D - SHIPS FREE! LO 20W x 18D - SHIPS FREE! LO 16W x 16D - SHIPS FREE! LO 16W x 18D - SHIPS FREE! LO 18W x 16D - SHIPS FREE! MAX 20W x 16D - SHIPS FREE! Matrx AirFlo Contour Cushion is manufactured by Invacare. Invacare is one of the largest medical supply companies in the world. The Matrx AirFlo Seat Cushion is designed with three different contour options to choose from--GENTLE, LO and MAX. 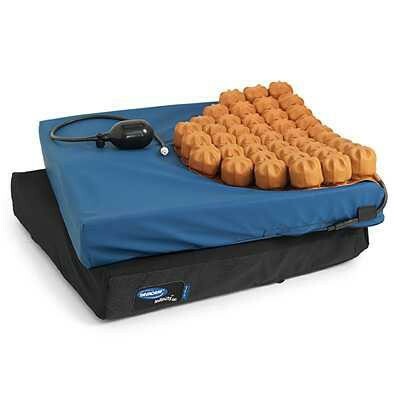 Each Matrx AirFlo Cushion is made with an air flotation insert combined with a folded foam base. The AirFlo Cushion is designed for people with a very high risk of developing skin breakdown. The postural support layer provides support and stability to the legs, assists in pressure redistribution, and reduces shear due to sliding. The air flotation insert of the AirFlo Cushion inflates to provide optimal immersion of bony prominences. The user-friendly inflation bulb allows one-handed adjustment of inflation level, while the quick-disconnection system seals the air instantly when detached. Each Matrx AirFlo Cushion comes with two covers -- a moisture-proof, antimicrobial inner cover to protect the foam, and a highly stretchable outer cover provides maximum conformity to the patients's shape. LO Contour Cushion features a non-contoured front end for very active users. This contour cushion accommodates "windswept" deformities. Max Contour Cushion provides aggressive leg positioning and enhanced pressure redistribution. AirFlo floatation insert layer offers very high pressure reduction designed to provide optimal immersion of sensitive bony prominences. Postural support layer is constructed of durable, high-density polyurethane foam and features reinforced lateral bevels which provide firm adductor support and allow the cushion to be used on a drop base with no carving required. User friendly inflation bulb accommodates the AirFlo Cushion to individual needs. Seat Width Range: 13 to 22"
Seat Depth Range: 15 to 20"
Seat Cushion Thickness: 2.25 to 2.75"
Weight: 4 to 5 lbs. Invacare Matrx AirFlo Contour Cushion Warranty: 2 years.